We are excited to introduce a new and innovative CRO protein analysis service in our CLIA registered lab for Pharmaceutical and Biotech Companies using traditional western blots in their research, development, and QC labs. We now offer an automated Simple Western Blot CRO service on our upgraded Technologies - "PeggySue" and "Wes". A major challenge in protein research is obtaining quantitative, reproducible, high content information quickly. SBH Diagnostics offers a new automated process (Simple Western™) using a novel capillary electrophoresis (CE) based immunodetection platform for protein separation and characterization. Proteins can be separated by size as in traditional PAGE Western or by their pI as in traditional CE or isoelectric focusing. 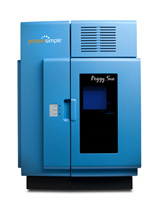 The SBH Diagnostics Service offers Simple Western™ currently used in big pharma for vaccine development, cell lysate analysis (from tissue culture or tumors), identification and quantitation of tumor-associated proteins, focusing on key kinase inhibitor targets in precious clinical patient samples. The Caption below describes the Fully Automated process, for either molecular weight separation of proteins or separation by their pI. Size/Charge-based characterization of proteins has been predominately performed by either SDS-PAGE/IEF/Western blot analysis or by capillary electrophoresis (CE). Each technique has advantages –Western blotting exploits high sensitivity as well as specificity of antibody binding, and CE offers high resolution and reproducibility. 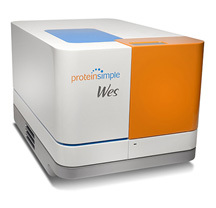 The sensitivity and resolution of the results obtained from either method is often challenged by the ability to preconcentrate or stack enough protein sample before separation. 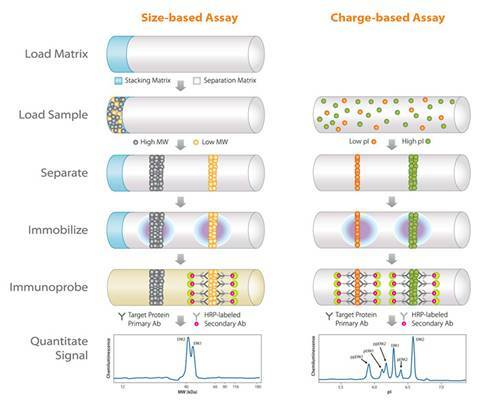 Simple Western is a new size-based or charge-based separation platform that runs Simple Western assays, combines for the first time the advantages of both Western blotting and CE into a single automated workflow. Optimization of stacking conditions results in a significant sensitivity and resolution increase using the Simple Western assay. Learn more about our new Simple Western Applications and capabilities. Click Here for more information on How Simple Western Works. Please contact us to discuss your Western Applications.